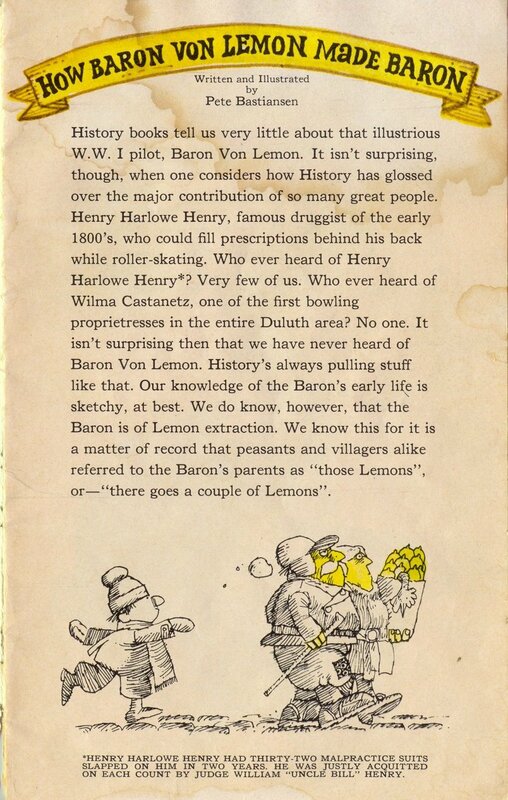 History books tell us very little about that illustrious W.W. 1 pilot, Baron Von Lemon. It isn't surprising, though, when one considers how History has glossed over the major contribution of so many great people. Henry Harlowe Henry, famous druggist of the early 1800's, who could fill prescriptions behind his back while roller-skating. Who ever heard of Henry Harlowe Henry*;' Very few of us. Who ever heard of Wilma Castanetz, one of the first bowling proprietresses in the entire Duluth area? No one. It isn't surprising then that we have never heard of Baron Von Lemon. History's always pulling stuff like that. Our knowledge of the Baron's early life is sketchy, at best. We do know, however, that the Baron is of Lemon extraction. We know this for it is a matter of record that peasants and villagers alike referred to the Baron's parents as "those Lemons", or-"there goes a couple of Lemons". *HENRY HARLOWE HENRY HAD THIRTY-TWO MALPRACTICE SUITS SLAPPED ON HIM IN TWO YEARS. RE WAS -TUSTLY ACQUITTED ON EACH COUNT BY JUIDGE WILLIAM "UNCLE BILL" HENRY.